Scientists, like Buddhist monks and Zen masters, have known for years that meditation can reduce anxiety, but not how. Scientists at Wake Forest Baptist Medical Center, however, have succeeded in identifying the brain functions involved. The study is published in the current edition of the journal Social Cognitive and Affective Neuroscience. For the study, 15 healthy volunteers with normal levels of everyday anxiety were recruited for the study. These individuals had no previous meditation experience or anxiety disorders. 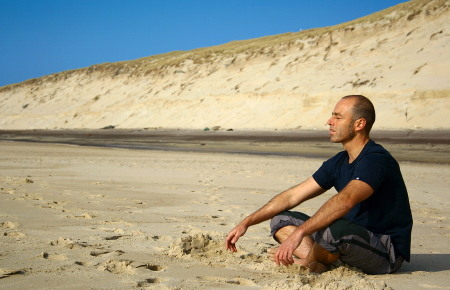 All subjects participated in four 20-minute classes to learn a technique known as mindfulness meditation. In this form of meditation, people focus on breath and body sensations, and non-judgmentally evaluate distracting thoughts and emotions. Both before and after meditation training, the study participants’ brain activity was examined using a special type of imaging—arterial spin labeling magnetic resonance imaging—that is very effective at imaging brain processes, such as meditation. In addition, anxiety reports were measured before and after brain scanning. The majority of study participants reported decreases in anxiety. Researchers found that meditation reduced anxiety ratings by as much as 39 percent. The study revealed that meditation-related anxiety relief is associated with activation of the anterior cingulate cortex and ventromedial prefrontal cortex, areas of the brain involved with executive-level function. During meditation, there was more activity in the ventromedial prefrontal cortex, the area of the brain that controls worrying. In addition, when activity increased in the anterior cingulate cortex—the area that governs thinking and emotion—anxiety decreased. Research at other institutions has shown that meditation can significantly reduce anxiety in patients with generalized anxiety and depression disorders. The results of this neuroimaging experiment complement that body of knowledge, by showing the brain mechanisms associated with meditation-related anxiety relief in healthy people, he said.